To mark the launch of Virgin Atlantic’s new ‘Little Red’ domestic service from Manchester to London, the airline gave the general public the opportunity to experience what life is like 30,000 feet up, down under! 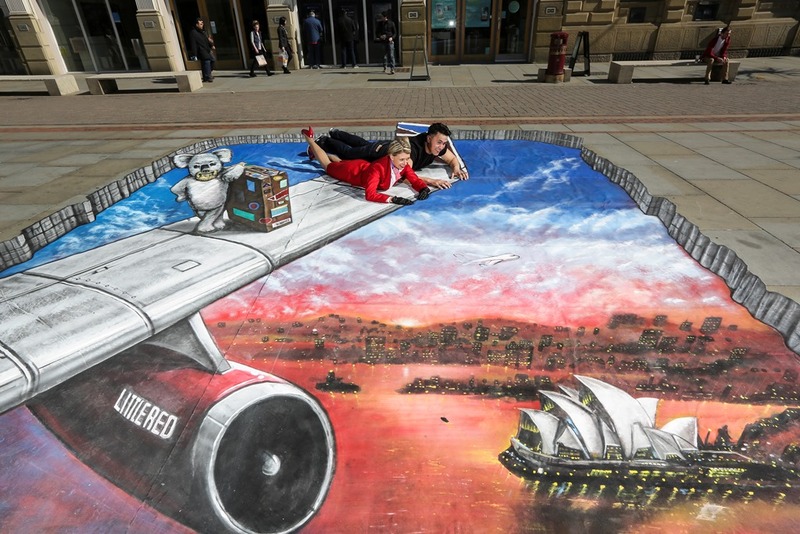 A stunning piece of 3D street art in Manchester city centre saw shoppers emulate Sir Richard’s trademark celebration by seemingly teetering on the edge of a plane wing, aided by Virgin Atlantic Airways famously glamorous cabin crew, who were on hand to ensure the event had that inimitable Virgin Atlantic Airways style. The artwork, commissioned especially from world-renowned street artists 3D Joe and Max, featured a glorious scene of Sydney Harbour, including the world famous Sydney Opera House and a rather familiar looking koala bear. Sydney is just one of Virgin Atlantic’s many long haul destinations which fliers from Manchester can now connect to using the Little Red domestic service. For the first time ever, passengers from Manchester will start their Virgin experience as soon as they leave their house, rather than waiting until they hit London. Bringing a splash of red to the skies of the North West, Sir Richard Branson’s Little Red service will offer four daily round-trips between Manchester and London Heathrow in addition to new domestic routes from Heathrow to Edinburgh and Aberdeen. As well as giving Manchester fliers added choice and great value, Little Red will be offering a taste of the customer service Virgin Atlantic is world-renowned for with free 23kg luggage check-ins, pre-assigned seats, complimentary snacks and drinks and even hot breakfasts on early morning flights. The schedule of the new flights is timed to maximise connections for passengers travelling onwards from London across Virgin Atlantic’s global network. Little Red flights will operate to and from Heathrow Terminal 1 but will have excellent connections with Virgin Atlantic’s international flights from Terminal 3. There will also be early flights to serve business fliers reaching morning meetings. The new chapter in Virgin Atlantic’s history will see an increased capacity on the routes previously operated by bmi, flying almost one million passengers domestically on four Airbus 320 aircraft in the distinct Virgin colours with region-specific names chosen by lucky local competition winners.